Ever have your to-do list become so long and complicated that you freeze up and do absolutely nothing? That's the kind of day I'm having. I have so many ideas for products, illustrations, and content and not enough hours in a day. And frankly? It bums me out. I try to focus on how far my little shop has come and the crazy amount of work I can get done in a day when I put my head down and do it. My constant frustration is always that gap between where I am and where I envision my brand to be. So I decided to close all of my browser tabs and stop stressing myself out with research and to do lists, and pop over here for a bit to chat with (at?) you all about what's been going on in my little world. I've been working on my tarot illustration series for my tarot deck! I officially settled on a name for my tarot deck. I'll be announcing that on a separate post soon, or you can view my public Patreon post if you just can't wait. ;) I'm pushing my target launch date for the deck to early-to-mid 2019 because I am getting through these illustrations at a slow, perfectionist, virgo pace. Also, the holiday season is looming on my calendar and I'll need to devote time to adding Halloween and Christmas stickers to my shop and all of the work that goes along with that. I have quite a few followers on Instagram that are excited for the tarot deck and keep asking for updates about when it will be available. This makes me so happy, of course! Truly, it motivates me like nothing else could. But it also terrifies me. What if the deck doesn't come together like they're hoping? What if the price point is too high since I'll be independently publishing? Launching a tarot deck (which is essentially a collection of 78 mini art prints) is an enormous undertaking. I'm exploring options like Kickstarter to make it more feasible. Everything is a little up in the air right now but I am determined to do the damn thing, don't you worry. I've renewed my love for paper planning! 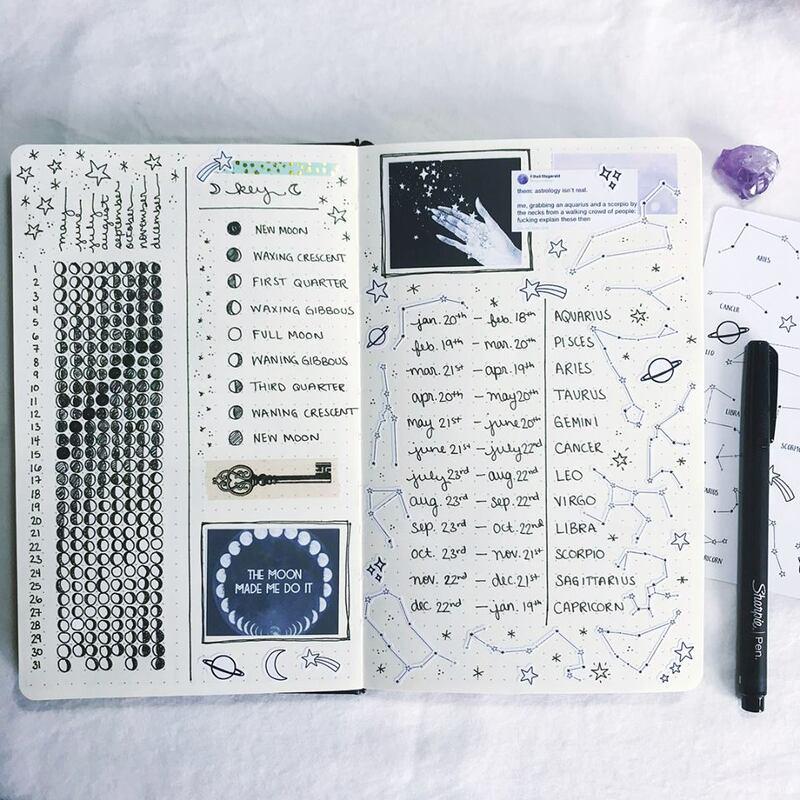 Generally, I feel compelled to make my planner spreads pretty, use mainly my own products, and share pictures to Instagram to promote my shop. In other words: take something I started doing for fun and turn it into a work-related task. Yuck. One day a couple months ago, I gave myself permission to just ~play~ and create. Sure, I used plenty of my own stickers because that's what I have on hand. I also decided to print out some images from my Pinterest boards to mix it up. I love how these spreads came together when I was able to just let my creativity flow. I've been using this bullet journal all Summer, but just switched over to my new Ban.do planner that started this week (it goes August 2018 - August 2019). The first half of 2018 was pretty terrible for me from a mental health stand point. I won't go into the specifics, but it involved a nice cocktail of seasonal affective disorder, trauma from serving on a grand jury, general life stress, and horrible withdrawal symptoms from coming off an SSRI medication. I'm finally in a very good place and honestly feel like a phoenix risen from the ashes. It's such a relief to feel like myself again, be able to actively enjoy my day to day life, and interact with other humans without wanting to cry. I'm learning more and more every day about myself and my needs and how to structure my work-life balance in a way that's healthy. Thanks so much for reading. I hope you are well and that you have a wonderful day.